Preheat oven to 325 degrees F. Line 12 cupcake cups with jumbo (3 ½ inch) paper liners (e.g. Reynolds Foil Lined Baking Cups or ones with 1 3/4 inch high sides). You can also use smaller cups and make more than 12. Mix the dry ingredients (flour through sugar) together in a mixing bowl. Add the butter, oil, eggs and vanilla and stir until mixed, then gradually add the buttermilk. Stir well, then beat with an electric mixer for 1 minute or just until blended. Divide batter evenly among cupcake cups and bake for 25 minutes at 325 or until cakes are set. Let cool completely. Note: Smaller cupcakes will take less time. To make the filling, beat together all ingredients (starting with 3 tablespoons of milk and adding more only if needed) except for whipped topping. Fold in the whipped topping. Also, don't forget to taste and adjust milk/peanut butter/sugar to make sure YOU like it. 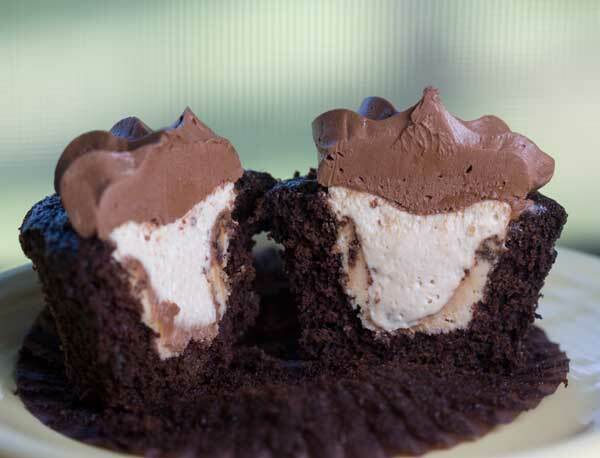 Cut a big hole in each cupcake and reserve cuttings. Fill holes with peanut butter filling. Crumble some of the reserved cuttings over hole to cover peanut butter. Put in the refrigerator to chill. In a large mixing bowl, mix the butter, sour cream sugar, cocoa, salt and 2 tablespoons of the cream as well as you can, then beat with a hand-held mixer until pasty and thick. Continue adding remaining cream until you get a nice, smooth, spreading consistency. Put the icing in a piping bag fitted with a large star tip or in a heavy duty freeze bag of which you will snip off the tip. Pipe a big star or dot over the hole where you buried the pie filling. Play around with the pie filling ratios if you want. These taste better after they've been thoroughly chilled....or at least the filling does. You can half the frosting if you want. I like to use a lot of frosting so I make more than enough and save the rest by putting the filled piping bag in a closed zipper bag and saving it in the refrigerator. The cupcake recipe also halves well too, should you only wish to make six.